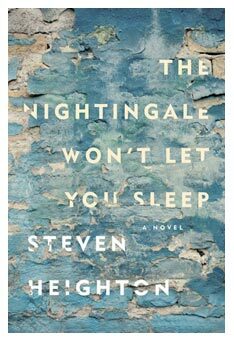 Steven Heighton, novelist, short story writer and poet, will read from his latest book, The Nightingale Won’t Let You Sleep, on Thursday, Feb. 15 at 7 p.m. in the Ganong Hall Lecture Theatre at the University of New Brunswick’s Saint John campus. Mr. Heighton is the author of 14 books, including three short story collections, three novels and six poetry collections. His poetry collection The Waking Comes Late, received the 2016 Governor General’s Award for Poetry. He is also the author of the novel Afterlands, which was a New York Times Book Review Editors’ Choice, and a “best of year” selection in 10 publications in Canada, the USA and the UK. It has been optioned for film and is in pre-production. In addition to receiving a Governor General’s Award for Poetry, he is also the recipient of the Gerald Lampert Award, the 2010 K.M. Hunter Award, the 2011 P.K. Page Founders’ Award, The Petra Kenney Prize, the Air Canada Award, and four gold National Magazine Awards. In the The Nightingale Won’t Let You Sleep, Elias Trifannis is desperate to belong somewhere. To make his dying ex-cop father happy, he joins the military – but in Afghanistan, by the time he realizes his last-minute bid for connection was a terrible mistake, it’s too late and a tragedy has occurred. The Lorenzo Reading Series acknowledges the support of the League of Canadian Poets, UNB’s Saint John campus, UNB the Saint John Bookstore, Canada Council for the Arts and its private reading sponsors.